Take a look back at one of the controversial chapters in America’s 19th century labor movement. 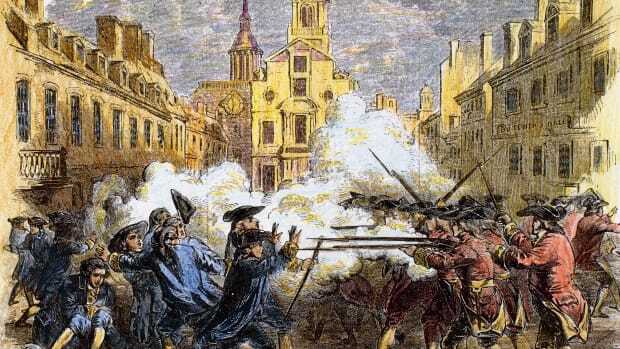 Engraving of a scene from the Haymarket Riot. The May Day protests attracted a wide swath of supporters including immigrant laborers and radical anarchists, some of whom had previously preached for violent revolution using dynamite. 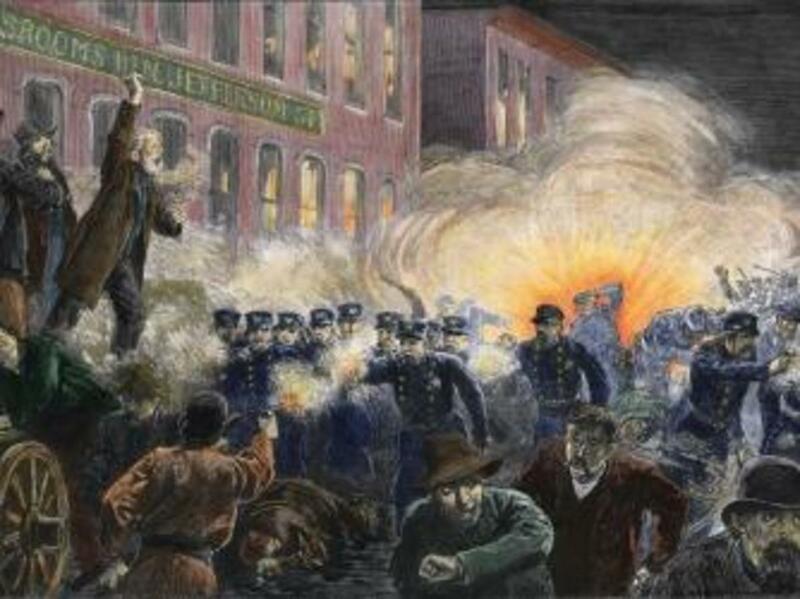 Police and private Pinkerton guards stood ready to suppress the strike, and while the May 1 march proceeded without incident, the uneasy truce soon collapsed. On May 3, striking workers at the McCormick Reaper Works rushed the factory during a shift change and began fighting with non-union “scabs.” Police arrived and leapt into the fray, attacking workers with clubs and firing their revolvers. Within minutes, several strikers were wounded and at least two were killed. 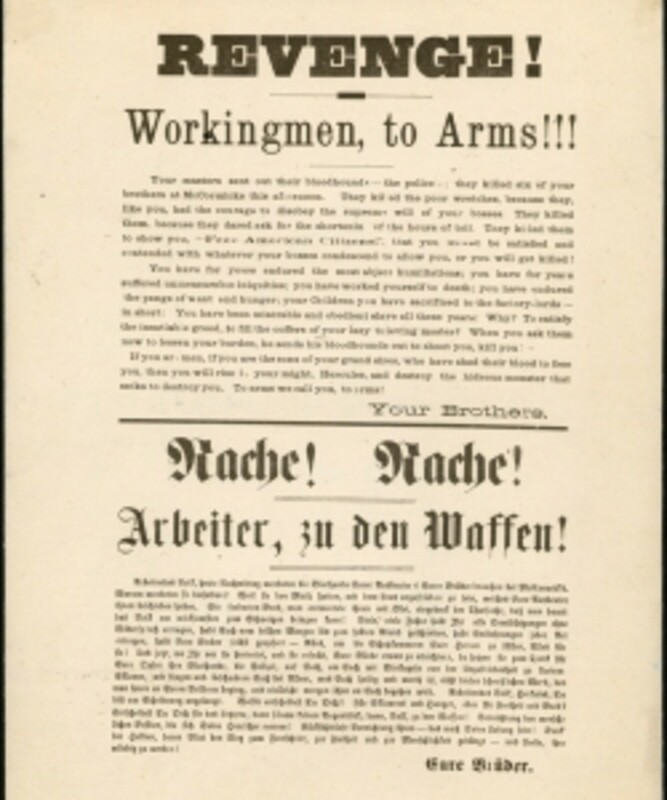 The Revenge flyer printed shortly before the Haymarket Riot. Anarchist leader August Spies was among the many people left fuming by the McCormick melee. The German immigrant had been giving a speech to strikers a short distance from the factory, and he had witnessed police open fire on workers. With his blood boiling, Spies rushed to the offices of the Arbeiter-Zeitung, an anarchist newspaper he edited, and wrote a leaflet denouncing the incident. He headlined the flier “Workingmen, To Arms,” but a typesetter later added the word “REVENGE” before it went to print. That evening, as word of the McCormick killings spread, another group of Chicago anarchists planned an outdoor rally to protest police brutality. 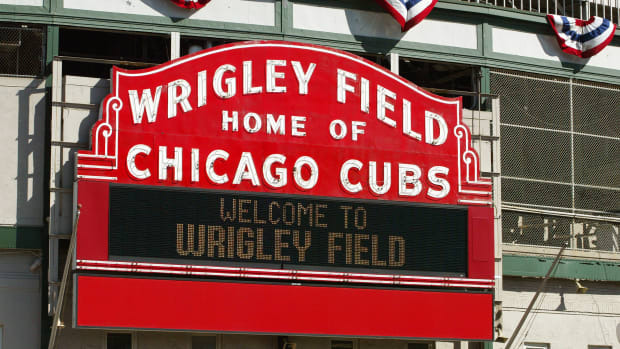 They scheduled the gathering for the following evening at Haymarket Square, a large space on Desplaines Street where farmers sold produce. 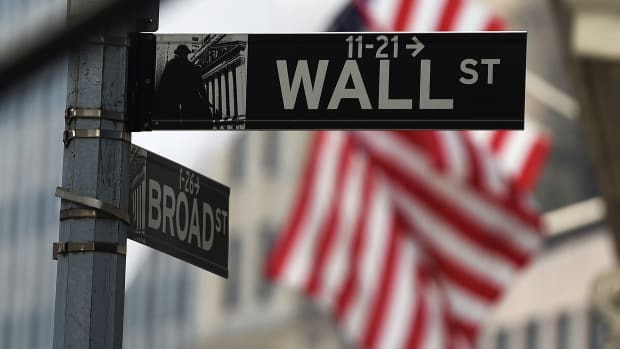 Around 8:30 p.m. on May 4, as a chilly wind swept across Chicago, the streets near Haymarket Square swelled with some 2,000 workers and activists. August Spies opened the rally by climbing atop a hay wagon and giving a speech on the eight-hour movement and the “good, honest, law-abiding, church-going citizens” who had been attacked at the McCormick factory. He was followed by Albert Parsons, a former Confederate soldier turned radical anarchist, who spoke for over an hour. Prominent among the thronged listeners was Chicago Mayor Carter Harrison, who attended the meeting to ensure it was peaceful. The Mayor had taken the precaution of stationing six companies of police nearby, but after listening to the speeches, he became convinced that the rally was not a safety risk. Before leaving, he conferred with police Inspector John Bonfield and told him not to intervene. Shortly after the Mayor’s departure, the wind picked up and brought a light rain. Only around 500 people remained around 10:30 p.m., when the rally’s last speaker, a British-born stone hauler named Samuel Fielden, counseled his listeners to “Keep your eye on the law…Throttle it. Kill it. Stop it.” Despite Harrison’s earlier order, the inflammatory remarks convinced Inspector Bonfield to act. 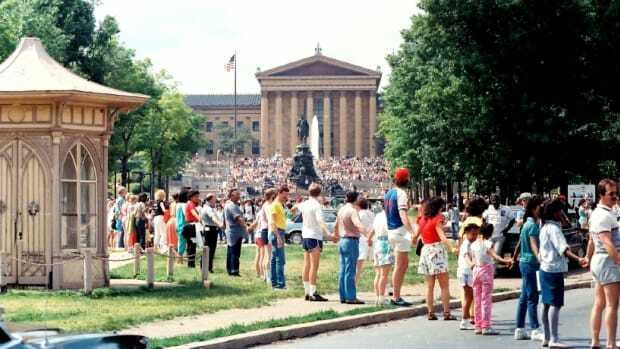 Moments later, as Fielden was wrapping up his speech, a phalanx of 175 blue-coated police advanced on the crowd and ordered it to disperse. Fielden protested that the meeting was “peaceable,” but soon gave up and agreed to leave. As Fielden climbed down from the hay wagon, the tension was suddenly broken by the sight of a homemade dynamite bomb, its fuse lit, flying from the crowd and into the ranks of police. The device exploded with a roar and a blinding orange flash, spraying shrapnel through the bodies of several officers. One of them, Mathias Degan, would soon perish from a severed leg artery. Portraits of the Haymarket Martyrs. Just what happened next remains a subject of debate. Several witnesses—including a group of unaffiliated businessmen—said the police panicked and fired away with their Colt revolvers, hitting protestors as well as several of their fellow officers. The police, meanwhile, almost unanimously claimed that members of the crowd drew guns and instigated a shootout. Whatever the cause, the result was pandemonium. “Everybody was running,” Spies later recalled, “and people fell, struck by bullets, right and left.” When the furor finally subsided, some 60 police officers lay wounded, seven of them mortally. Several dozen civilians were injured, and at least four were killed. The Haymarket bombing provoked a frenzied response from the media, which largely framed the incident as the work of immigrant radicals. A law journal branded the protestors “long-haired, wild-eyed, bad smelling, atheistic, reckless foreign wretches,” while the Chicago Times called for the public to “whip these Slavic wolves back to the European dens from which they issue.” Wild rumors soon circulated about anarchist conspiracies and bomb plots. Martial law was declared in Chicago, and police rounded up hundreds of suspected dissidents. Throughout it all, the identity of the Haymarket bomb thrower remained a mystery. Nevertheless, on May 27, eight anarchists were indicted for murder in connection with the riot—August Spies, Albert Parsons, Samuel Fielden, George Engel, Adolph Fischer, Michael Schwab, Louis Lingg and Oscar Neebe. 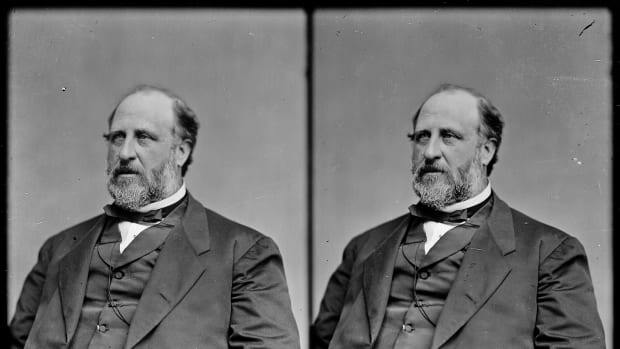 The trial of the so-called “Chicago Eight” kicked off on June 21, 1886. The “red scare” sweeping the city made it almost impossible for the court to select impartial jurors, and Judge Joseph Gary eventually seated a few men who admitted that they considered the defendants guilty. Even stranger was that the eight anarchists were tried together despite having varied degrees of connection to the crime. Only three of them had actually been at the Haymarket rally, and just two had been involved in planning it. The only one of the accused who could be directly linked to the bomb was Louis Lingg, a hardline anarchist who had been collared after police found dynamite in a house he frequented, yet he had been absent from both the planning meeting and the Haymarket rally. Defendant Oscar Neebe, meanwhile, had done virtually nothing other than display a copy of August Spies’ flier. 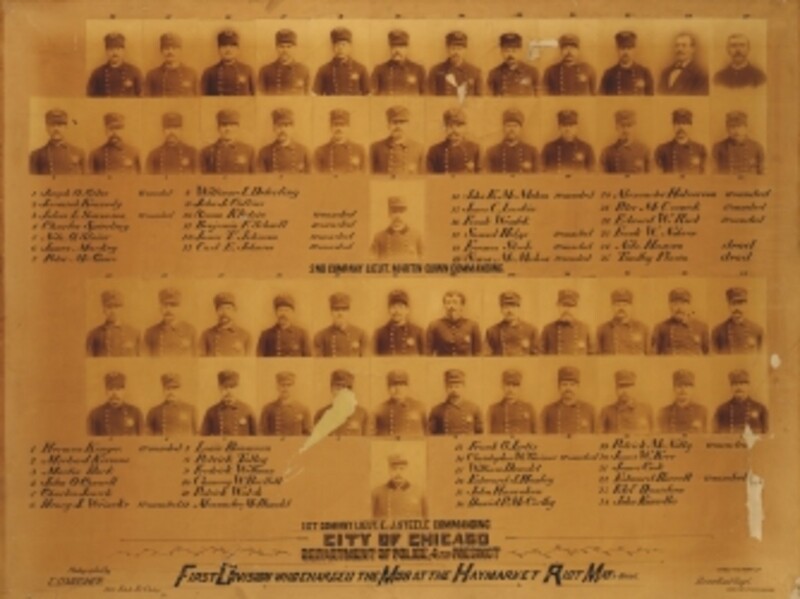 Group of portraits showing the members of the Chicago Police’s First Division, who charged the mob at the Haymarket Riot, Chicago, IL, 1886. In the absence of evidence that any of the Chicago Eight had thrown the bomb, State’s Attorney Julius Grinnell centered his case on whether they had “abetted, encouraged, and advised” the heinous act. He pointed to Spies’ May 3 “Revenge” flier as proof that the rally was part of a larger terrorist conspiracy, and he had witnesses testify about the men’s history of incendiary statements and writings. The defense countered the charges with its own witnesses, but Grinnell’s strategy of putting “anarchy on trial” ultimately prevailed. In August 1886, the jury took just a few hours to find all eight men guilty. Oscar Neebe was given 15 years of hard labor. The rest of the defendants were sentenced to death. Almost immediately after the verdict, the defendants’ supporters launched a sweeping clemency movement. Schwab and Fielden both requested mercy from Governor Richard Oglesby, who commuted their sentences to life in prison, but the other condemned men scoffed at the notion of begging for their lives. On November 11, 1887, Spies, Parsons, Engel and Fischer were all hanged. Only Louis Lingg managed to cheat the noose: the night before the execution, he committed suicide in his cell by exploding a smuggled dynamite cap in his mouth. The Haymarket affair did not end with the executions. 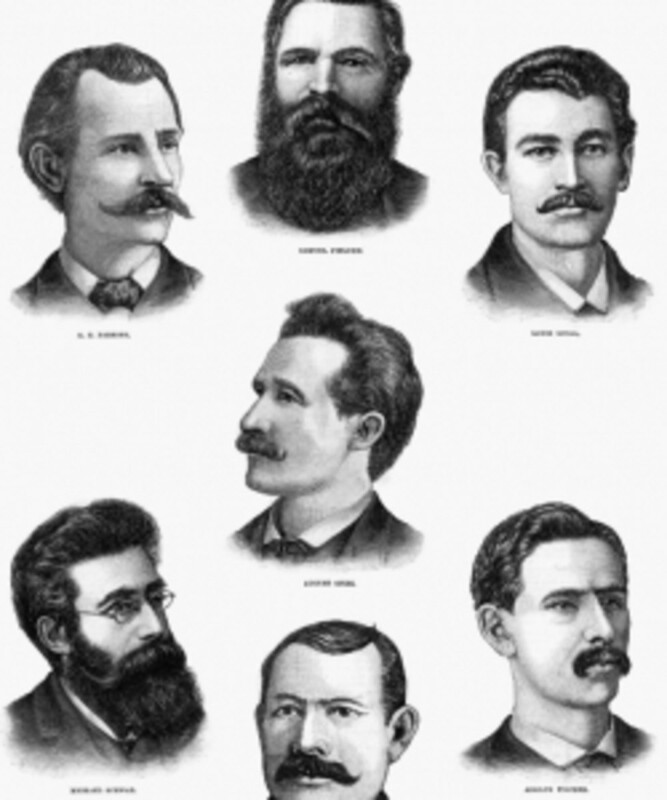 Critics continued to argue that the Chicago Eight had been victims of a government witch-hunt, and they later received partial vindication in 1893, when Illinois Governor John Altgeld reviewed the court transcripts and concluded that judicial bias and public hysteria had robbed the defendants of a fair trial. As a result, Neebe, Schwab and Fielden were granted a full pardon and released from prison. A Haymarket monument went up in Chicago’s Waldheim Cemetery that same year, and the workers’ story later became a rallying cry for labor activists around the globe. Photos of the “Haymarket martyrs” found their way into labor halls from Europe to Latin America. The men even appeared in a Mexico City mural by artist Diego Rivera. 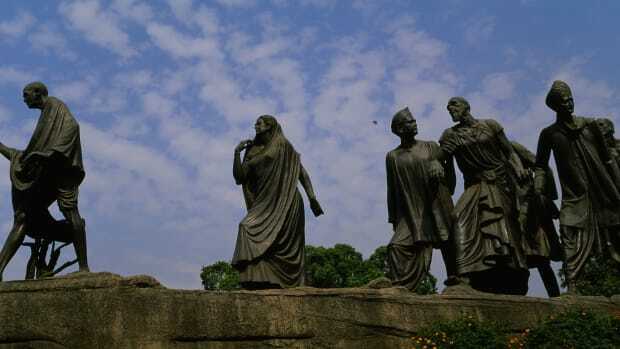 Along with the 1886 May Day protests, the incident also played a major role in the selection of May 1 as the date for International Workers’ Day.